The maundy ceremony for 2019 is again held at St Georges Chapel, Windsor. The maundy ceremony in 2018 was held at St Georges Chapel, Windsor on the 29th March 2018. Maundy service entry tickets, Programmes wanted. Proof set cases and Specimen set cases for sale. 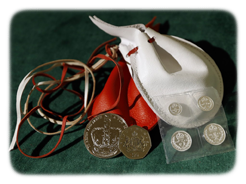 As well as Maundy we also specialise in older UK Proof and specimen sets. www.maundy.co.uk has been trading in Maundy Sets and the associated memorabilia for many years. We are happy to offer a FREE valuation service for insurance or sale purposes on any Maundy Sets, please use the contact us for details or to arrange a valuation. Please note that for security purposes all the coins for sale on this website are held in a bank vault and no coins are kept at our premises. 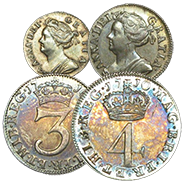 Visit our sister site, www.maundymoney.info, for more information on Maundy -- history, services, coins.